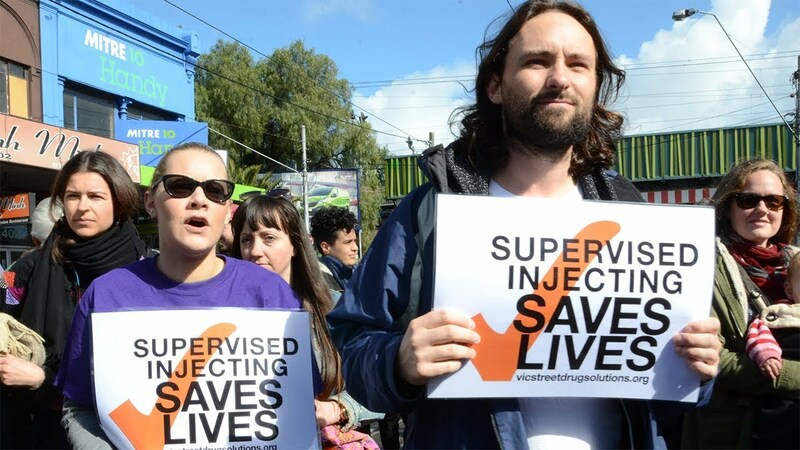 Residents, local traders and other community members have been fighting a long battle to trial a medically supervised injecting centre in Melbourne’s North Richmond. They are concerned at the appalling loss of life – with many people dying unnecessarily as a result of heroin overdose. And they are concerned about the broader negative impacts that this drug use is having on their neighbourhood. Similar centres have worked well in many cities around the world, including one in Sydney. A Victorian parliamentary inquiry investigating the trialing of a supervised injecting centre is currently with the Victorian Government for its consideration. While receiving a number of submissions supporting the establishment of a centre, the inquiry’s report stopped short of recommending the trialing of one in Richmond. The issue is now to be debated by state MPs. Laura Turner delivered the following speech in front of a crowd of several hundred concerned citizens in a North Richmond back street in August 2017. It captures the tragic and potentially preventable circumstances surrounding the death of her sister, Skye, from a heroin overdose. Laura’s speech is a plea for all of us to see heroin users as real people needing our help. And it’s a call to action to our political representatives to trial a medically supervised injecting centre as soon as possible. I want to ask everyone to picture this – a beautiful young woman. She’s razor sharp with intelligence. She’s ever quick with wit. She’s gorgeous, striking with beauty and she’s successful. Working and contributing to society, she has men falling at her feet. She drinks on the weekends. She parties. She fits the mould of “normal” that society accepts. Everyone knows someone like her. A lot of people want to be her. Her name is Skye Turner and she’s my sister. The incredible young woman, who was so loved and admired by most, slowly became a bit of a burden. The drinking got heavier. She started missing work. The depression got deeper. The friends fell away. The manic episodes got darker. Even family members stepped back. Skye, who once was the epitome of beauty, success and intelligence, had fallen off her pedestal. I would think: You’re embarrassing me. On March the tenth, Skye overdosed on heroin. She lay dead in the back of a van on Elizabeth Street in Melbourne’s CBD for hours. That beautiful face, that incredible mind, had slipped away. I used to be one of those people who got angry at addicts. So frustrated, I would say this is easy, just stop abusing your body and life will get better. It took me years to understand it is not a choice. Addiction is not a choice. Anyone who thinks a young mother uses illicit drugs for pleasure is sadly mistaken. So often they are doing it to escape the hand they’ve been dealt in life. I implore those who think “it’s their choice, they deserve it” to think about the long long road a person can travel before they turn to such a filthy drug as heroin. The road can start in childhood: maybe there was trauma, maybe there was abuse, maybe this person suffers PTSD, maybe they’ve lost a child of their own and can’t cope with the sadness. All of these people are looking for an escape. I implore those people who spew hate at addicts to understand that addiction knows no bounds and neither does the trauma or life experiences that can cause it. A safe injecting room isn’t a place to party, this is a common misconception I’ve heard, it’s not a place where drugs are handed out for free and they all go and have a good time. It’s a place where addicts, people who have suffered some of the worst that life can throw at us, can go and have medical supervision while they inject the drug they probably hate. On top of that, it’s a place where they can go to ensure they don’t die while dealing with their pain. It’s a place that will connect these people with help, support services and put them on the right track. And at the very least, is a place that shields the rest of society from having to look at the hideous reality that is heroin addiction and it’s aftermath – that aftermath is needles and bodies in the streets. Those bodies, all 173 of them who we lost last year, are people. Yes their life choices are ugly, they’re uncomfortable, they’re not “normal”, but I guarantee you all of those choices are the effect of an experience in life that all of these people were powerless to stop. Skye as not just my sister, she was my mother’s daughter, and she was her own daughter’s mother. She was a person who needed help. Skye’s death is the perfect example of how a safe injecting room saves lives. Had she overdosed while in a safe injecting room she would have been revived, she would still be alive, she would have likely gone around to the recovery area in that facility and been connected with support services, housing and counseling. She would be alive. Isn’t keeping someone alive the most basic human instinct that we all have? And to be kept alive, isn’t that what we all deserve? Simply to stay alive? I’ll never know what Skye’s final thoughts were. I’ll never know if she was in pain? But I’ll forever feel the heartache of choosing Skye’s coffin and watching it sink into the ground. I’ll never forgive myself for being angry with her at times, for ever thinking there was a simple way out. It was only in the final few years of her life that I realised her addictions were bigger than she was. Her behaviour was not personal, she wasn’t intentionally thumbing her nose at the law or better judgment. She extremely sick and that ruled her. To those who are angry at addicts, those who think they chose this therefore they deserve this, I implore you to hear me – I thought that once too, and I get it. You think for a person to do that to themselves, they must want to. Believe me when I say they don’t. I watched my sister’s decline for years, and by watching I learned sometimes the people you love have no power over themselves. Sometimes the demons, the trauma, the mental illness has the power that can take over a person. We forgive those who smoke and cause their own cancer. We forgive those who speed in their cars and threaten the lives of others. I’m asking the community to understand the anguish that drives an addict, the desperation that drives the syringe. I’m asking anyone who might question the value of a safe injecting room – look at the people on this stage, they have lived and breathed the hell that is addiction. They’ve lived the desperation of trying to keep someone alive; and it’s they who just want a trial of a facility that could keep alive the sons and daughters, brothers and sisters who have suffered to the point of turning to this hideous drug. Loretta Gabriel’s campaign for safe drug injecting rooms has also captured hearts in Melbourne. Loretta is pictured here speaking to the community rally that gathered in support of trialling a medically supervised injecting centre in North Richmond. Hear Loretta’s interview with Jon Faine that broadcast on ABC Radio Melbourne in July 2017. The community gathers in support of a medically supervised injecting centre in North Richmond.